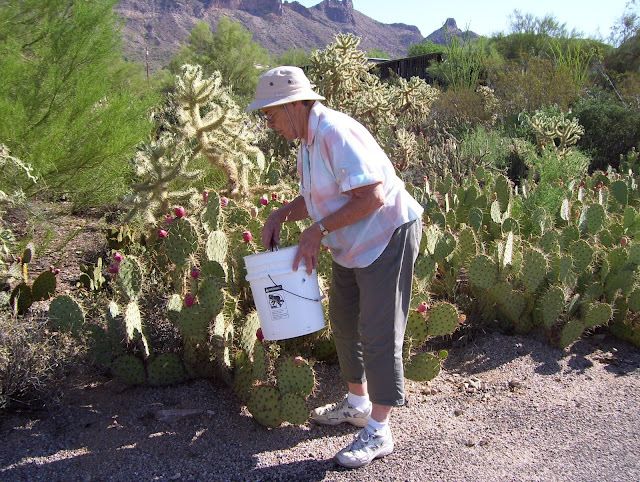 Jean Groen picking juicy prickly pear fruit. The central Arizona town of Superior is getting into the desert spirit with their first Prickly Pear Festival on August 25. They will beat the heat by starting early at 6:30 a.m. with a guided desert walk, followed by an pancake breakfast (just a base for prickly pear syrup!) from 8 to 9:30. At 9 a.m. , just 25 lucky participants will join Pete Rendek to learn how to brew prickly pear pale ale. Other vendors will be offering prickly pear products including Cheri from Cheri’s Desert Harvest with her delicious syrups, jams and candies. The Chocolate Lady will bring chocolate prickly pear truffles (can’t wait for those) and restaurants in town will feature special prickly pear dishes. Jean recently had one of her recipes using prickly pear pads (nopalitos) printed in Better Homes and Gardens magazine. What an honor. You know when nopalitos make it into a magazine like BH&G, that they are making their way into the national consciousness. Jean has shared the recipe with us below. 1 ½ c. peeled and chopped tomatoes. Squeeze tomatoes to remove juice and seed before chopping. Mix first 9 ingredients. Stir well and let set for 10 minutes. Combine water and pectin in saucepan. Bring to boil on high. Boil for 1 minute. Pour into the vegetable mixture. Stir 3 minutes. Put in containers and store in freezer. For more recipes for prickly pear, check out The Prickly Pear Cookbook and Cooking the Wild Southwest. Both books give complete information on harvesting and preparing both the pads and fruit of the prickly pear as well as turning them into delicious dishes your family and guests will love. This will be a wonderful and fun event. One of the venders is Prickly Pear Products LLC who will be speaking on the health benefits of prickly pears and offering free tastes of prickly pear juice. I hope the town of Superior will make this an annual event as it will be fun for the whole family.